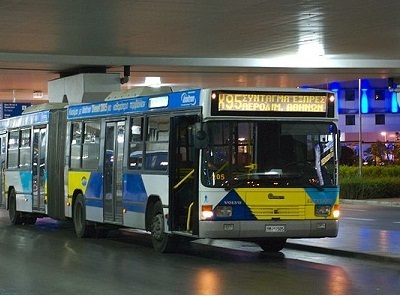 There are four different bus routes starting from Athens airport. All bus routes are available 24 hours a day - 7 days a week. Departure time: The buses leave every 30 to 60 minutes depending on the route. For the exact departure times of each route check the links at the left. You can read the descriptions below to find out which bus is the one you should use. By click on the links you will see the map of the route and the bus arrival and departure timetables. Bus X95 takes you directly to Athens city center (Syntagma square). Many ancient monument are in a walking distance from there: the Acropolis and the Parthenon, the Acropolis museum, the Temple of Olympian Zeus, the Roman Market and much more. Syntagma square is also the best place to get the vibe of Athens. From syntagma square you can walk to Plaka, Theisio, Monastiraki. All those areas offer pleanty of great view to Acropolis and other monuments, pleanty of eatting opptions, pleanty of shopping options and at a great vibe of the busy cuty of Athens. Also, from Syntagma square you can catch a taxi to anywhere in Athens with quite low. This is the bus to use is you plan to take a ferry from Piraeus to the greek islands (Santorin, Mykonos, Paros, Kos, Crete, Rhodes etc.). It takes about 90 min from Athens airport to Piraeus depending on the traffic. However its a nice route if you have the time. This route connects Athens Airport with Elliniko metro station. See map, blue line. It departs every 40 to 60 minutes.